Hotel Guru Exclusive - Hotel Guru Exclusive - Early check in/Late Check out, Room upgrade (subject to availabilty) + welcome drink, airport transfers. With stylish rooms starting from just €70 per night, this is great value. Traditional Moroccan cuisine, with a daily changing menu. There are two outdoor pools, the larger one has a sound system and the smaller one is heated. Close to 3 beautiful golf courses: Royal Golf, Amelkis and Al Maaden. With Marrakech just 15 minutes away, you're wihin easy reach of all the sights. It's rare to find a Riad that looks exactly as its photos depicts. But Dar Layyina is just as breathtaking in reality as its images conjure in advance. What makes it even more special is the hospitality and warmth of the staff who make sure every need is considered. 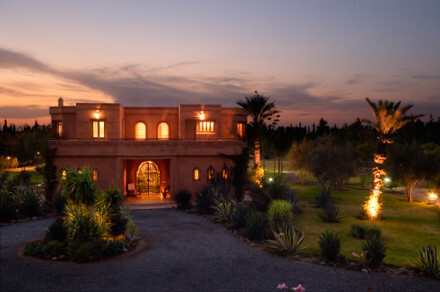 As the pictures suggest it is an oasis outside of central marrakech and whilst it's super intimate and relaxing as a couple it would also be riotously fun to take over with a whole group of friends and have no need to leave the riad all weekend. 15mn drive: Marrakech medina, Souks, Majorelle gardens…. We offer lunch and dinner. Our chef’s traditional cuisine is outstanding! Breakfast is included in the rate. All the rooms are clean, spacious and well equipped and beds are comfortable. The royal suite is amazing and has a stunning view of the Atlas. Book the entire property for up to 14 guests.